A branch with drying and brown seeds attached in bunches. This particular tree had bunches of these attached to them. 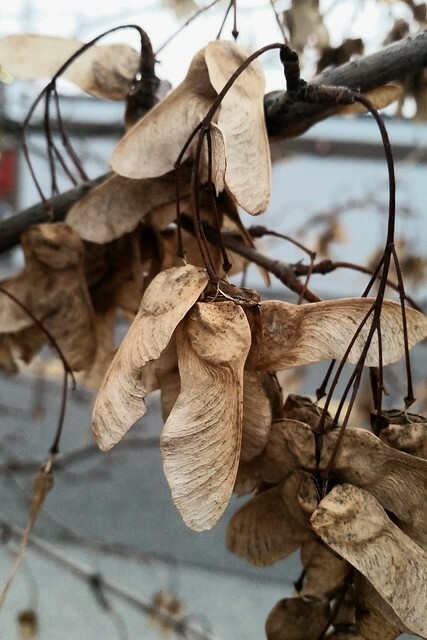 I'm not sure of their names--I think they're seeds of sorts, but I just remember as kids throwing handfuls of them up in the air and watching them twirl as they fall or peeling the thicker ends and sticking them on our noses. This is why the only names that come to mind for them are propellers or Pinocchios (What can I say--I can be really smart in some areas and completely ignorant in others). But these bunches stuck out to me as the tree had several dozen bunches with hundreds of these fellas attached to them and something said to me, "take a photo." I'm glad I did because it came out well and I don't think I would have noticed how much they resemble wings--that's something I have never noticed. Indeed, with the center one in this photo, you can see the membranes of the leaf throughout and it reminds me of a bat's wing in being able to see the membrane, but more like a bird's wing when you look at its overall shape.